Recently, the security situations worldwide are changing more quickly than ever before, and most Japanese companies, not only Chiyoda, focus on the importance of risk management, which includes gathering and analyzing risk information related to the countries where they are engaged in business, as well as establishing security counter-measures based on the analysis. 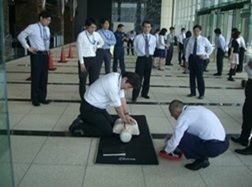 On April 1, 2013, Chiyoda established Crisis Management Department as a special office mainly to deal with risk management at overseas high risk area, on the basic principle “Employee’s Safety First”. They are gathering various risk information related to terrorist organizations, criminal organizations, elections, political situations, etc. from various information sources such as security consultants in Europe and the United States, the Ministry of Foreign Affairs, Japanese Embassies, the U.S. Dept. of State and others. Based on the information, counter-measures are discussed and implemented. Risk pre-investigations in high-risk countries, determination of pros and cons for dispatching staff to high-risk countries, risk assessment in high-risk countries, etc. Gathering information about crisis management in general, and exchanging information with related organizations, etc. Crisis Management Department has developed a comprehensive checklist to determine necessary security measures for each overseas project. With the security checklist, we could take all the necessary measures seamlessly from the very early stage of the project. This system ensures a balanced approach to prepare for adequate security measures based on the conditions of each project site. Additionally, the unit has introduced a rule to review the checklist if necessary as security risks would change with each passing moment. Crisis Management Department has developed a comprehensive checklist to determine necessary security measures for each overseas project. With the security checklist, we could take all the necessary measures seamlessly from the very early stage of the project. This system ensures a balanced approach to prepare for adequate security measures based on the conditions of each project site. Additionally, the unit has introduced a rule to review the checklist periodically as security risks would change with each passing moment. The Chiyoda Group has prepared Disaster Response Manual (Japanese and English versions). The Manual compiles the actions to be taken in the event of a disaster by those working in the Group including all the directors, employees, temporary staff members, customers and partners, and so on. 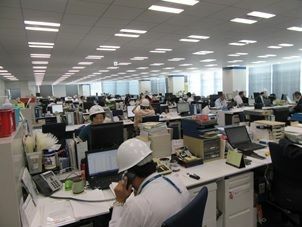 Once a disaster occurs, Chiyoda Disaster Prevention Force is to be formed, and the emergency communication route is also to be set up to confirm the safety of all the above personnel and their family members as a first priority.